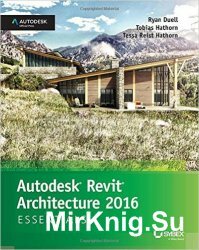 Autodesk Revit Architecture 2016 Essentials helps you get acquainted and quickly become productive with the leading Building Information Modeling software. With a real-world focus and a tutorial-based approach, this invaluable guide features concise, straightforward explanations and hands-on exercises that walk you through the entire design process. Each chapter opens with a quick discussion of concepts and learning goals, and then briskly moves into step-by-step instruction illustrated by compelling full-color screen shots. This new edition includes expanded information on rendering and visualization, and a new discussion surrounding effective work sharing, details and annotations, drawing sets, and professional workflows. The companion website features additional tutorials, plus downloadable data sets that allow you to jump in at any point and compare your work to the pros. Revit Architecture 2016 is a powerful, sophisticated BIM application designed to boost productivity with automated documentation for every design and update. This guide takes you through the entire design process, and shows you how to get the most out of Revit every step of the way.